1. Rifle's Manhattan print ($40), 2. New York Times keychain with charms ($12), 3. Mast Brothers Origin Chocolate collection including Brooklyn blend ($40 for 5 bars), 4. NYC subway mug ($20), 5. Little New York ornament set ($70), 6. Humans Of New York book ($17), 7. Love New York: Ingredients and Recipes cookbook and so much more ($32), 8. 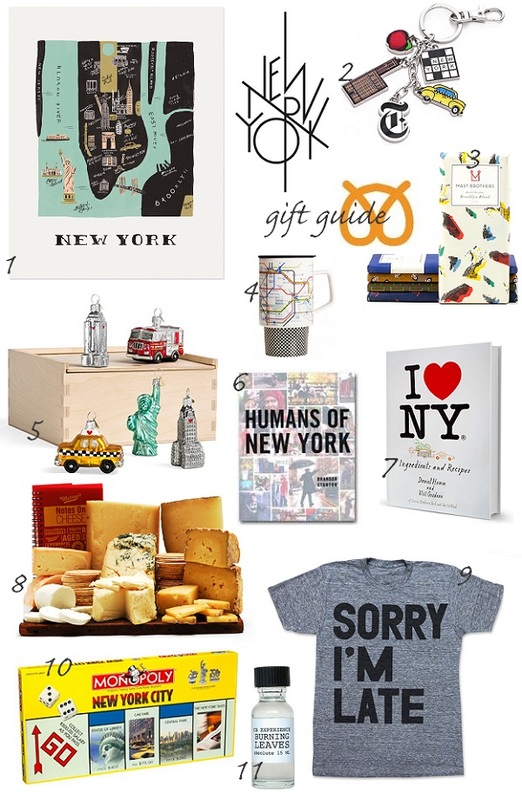 Murray's 'The New Yorker' gift crate ($125), 9. Sorry I'm Late tee ($24), 10. Monopoly New York City Collection board game ($35), 11. Bottle of burning maple leaves scented perfume from the amazing CB I Hate Perfume ($50). P.S: Also, yesterday's gift guide for honey lovers. P.P.S: And here are six 2010 gift guides, five 2011 gift guides, seven 2012 gift guides and nine 2013 gift guides. Jillian, we have one too and we love it. Each time someone comes over, we love playing it. Steph, the scent is simply amazing. Very pure and simple. I wear it daily. Cheese, cheese, cheese and lots of cheese would be my perfect gift. OH! I'm on my way to NY right now! (I'm in Poland on the airport)! I'd definitely die for Monopoly! NY/ Brooklyn chocolate sounds so good! Lydia, same here - I love cheese too! How awesome, Marcela:) Have a safe flight, sweetie.